Holidays are a good time to find the answer to complex mathematical problems using household items, MacGyver-style. 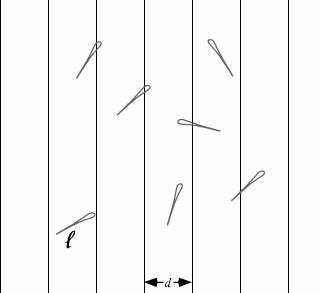 One way to find pi (yes, that pi) involves a flat surface, a little twig or pin, and patience. It's strange that the math MacGyver of the 18th century was called Buffon, but at least the guy was a French count. In the time he spent between punching people out when they made fun of his name he was a naturalist, a mathematician, and an architect of a Monte Carlo method of finding pi. Monte Carlo math is all about using random numbers to find solutions to complex problems. He took a piece of lined paper and dropped a needle on it again and again. 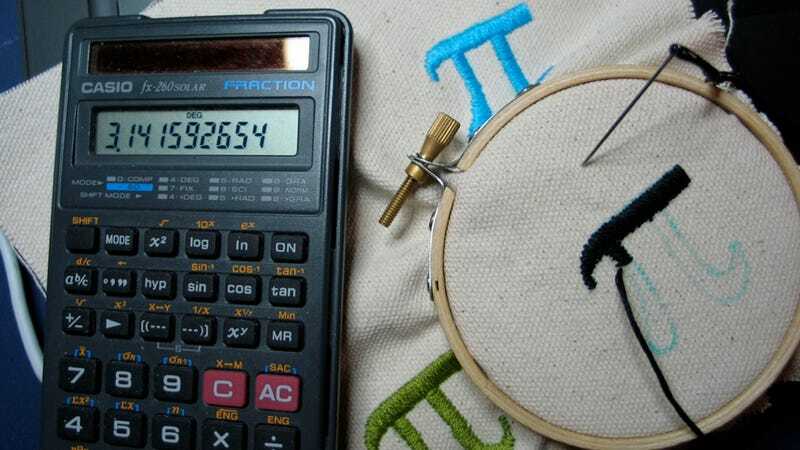 By counting the number of times the needle touched the lines on the paper, and calculated the value of pi. Buffon's Needle became a famous proof; one that can be used today. Buffon's Needle involves a smooth needle or twig of a certain length - say two inches. Take a piece of paper and make vertical lines two inches apart. Then raise the needle and drop it again and again, keeping track of the number of drops and the number of times the needle crosses a line. Either the needle will cross one of the drawn lines, or it will fall in such a way that it only touches an unlined panel. You can get an approximate value for pi by doubling the number of total drops and dividing it by the number of drops in which the needled crossed a line. Sounds like bullcrap, right? Well, look at it this way. How would you find the probability of total drops to drops with line crossings? Just divide total falls by the number of falls with line crosses, right? Well that's one half of the equation, so we're almost there. To get all the way there we just need to relate the probability of line crossings to pi. The math winds its way through geometry and calculus, but summarized it's like this - when the needle drops, it will drop at an angle to the nearest line. Two things will determine if the needle crosses the line; the angle that the needle takes and the distance to the nearest line. If the needle is straight up and down, ninety degrees from the horizontal axis and parallel to the line, no matter how close it gets it won't touch the line. If the needle is at zero degrees to the horizontal, perpendicular to the line, there's nowhere it can drop that it won't touch the line. You can compare the distance and the angle of the needle, and use it to plot a graph to show exactly where the angle and the distance combine to get the needle to just touch the line. Now reach back to distant days in math class. Angles don't always have to be expressed as degrees. They can also be expressed as values of pi, and ninety degrees is pi/2. Everything below the line in the graph is positions and angles at which the needle touches the line. Everything above is positions and angles at which the needle doesn't touch the line. The total area of the graph indicates the total number of drops. And the total area of the graph can be expressed in terms of pi. Find the total area of the rectangle, and divide it by the area of successful drops, and you'll have the same ratio you calculated by trial and error earlier. The total area of the rectangle, at least with the length of needle used in this, is pi/2. The area under the curve takes calculus to figure out, but it comes out to one. Divide pi/2 by one, and you get pi/2. So the total number of drops divided by the number of hits is equal to pi/2. Multiply the total number of drops by two, and then divide it by the total number of hits, and you get pi. Or you could just look it up. Top Image: Pillowhead Designs. Second Image: Gaussian Math. Via UKY and Gaussian Math.